Edmund Tudor is a relatively unknown figure in the annals of history but as the father of King Henry VII of England he is the patriarch of the Tudor dynasty of kings and queens. He was also the brother of a king. He had a good reputation in Wales before dying a surprising death aged only twenty-six, another casualty of the Wars of the Roses. Edmund was born c. 1430. He is sometimes referred to as Edmund of Hadham as he was born at the palace of Much Hadham, the home of his parents Owen Tudor and Catherine of Valois. Catherine was the French princess who married King Henry V of England and gave birth to King Henry VI so this made Edmund and his brother Jasper half-brothers of a king. After King Henry V died, Catherine supposedly married Owen Tudor who worked in her household. There is no actual written proof they married but Edmund and his siblings were recognized as legitimate offspring during their lifetime. When Edmund was seven years old, his mother died. Later that summer, Edmund and Jasper were placed under the guardianship of Katherine de la Pole, abbess of Barking and sister of the Duke of Norfolk. Not much is known of their early life but they were undoubtedly treated well during their stay in the abbey which lasted about five years. The abbess brought them to court when they reached adolescence to bring them to the attention of the king and most likely to seek funds as none had been provided for their maintenance. King Henry VI was fond of his half-brothers and later took them into his household. On November 23, 1452, King Henry ennobled Edmund and Jasper as high ranking earls. Edmund was made Earl of Richmond and Jasper was given the title of Earl of Pembroke. Edmund received as part of the estates of Richmond the manors of Frampton, Boston and Wykes, the sokes of Gayton, Mumby, Skirbeck and Kirton, the manor and lordship of Swaffham in Norfolk and some lands in Cambridgeshire. The brothers were knighted at the Tower of London on January 5, 1453 and were belted on the following day. In March of that year, they were recognized by Parliament as legitimate brothers of the king, born of the same mother. They were both named to the king’s Privy Council. At the same time, the dowager Duchess of Somerset, Margaret Beauchamp was summoned to Windsor along with her ten year old daughter Margaret Beaufort who was one of the wealthiest heiresses in England and a descendant of John of Gaunt, Duke of Lancaster by his third wife Katherine Swynford. The king gave her one hundred marks to buy clothes for her visit. Margaret Beaufort had been the ward of William de la Pole, Duke of Suffolk who married her to his son John. They were too young to consummate the marriage and Margaret remained with her mother. Suffolk was murdered in 1450 and Margaret’s wardship came back to the crown. There was little interest in her potential as an heiress until 1453 when the wardship and marriage of Margaret Beaufort was granted to Edmund and Jasper by the king. At this time, King Henry had no child to inherit the throne. He probably considered naming Edmund his heir and was motivated by Margaret’s royal blood and impressive inheritance to make a match between them. Shortly after this match was decided on, it was revealed that Henry’s queen, Margaret of Anjou was pregnant and she did give birth to a son in October of 1453. Just before the birth of his son, King Henry succumbed to an acute bout of mental illness and had no capacity to rule. Due to the king’s illness, the brothers had to navigate their place in the political turmoil of the 1450’s created by the conflict between the Houses of Lancaster and York. Initially they backed Richard Duke of York’s application to be Protector of the realm in Henry’s incapacity. Edmund was given the grant of the manor and the lordships of Kendal and Weresdale by Parliament. When the king regained his sanity, the brothers were in a tough position. At first Jasper tried to mediate a compromise but by the end of 1455, they proclaimed their definite allegiance to the king. On November 1, Edmund married Margaret Beaufort at Bletsoe Castle where Margaret had been born. 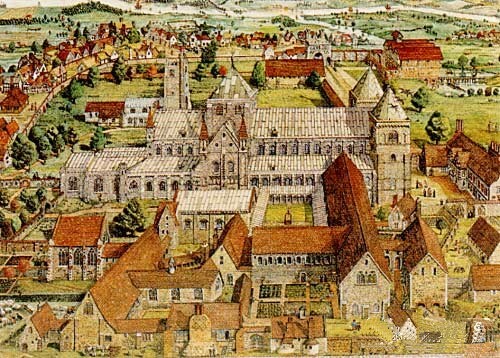 Edmund and Margaret, along with the Duke of York and other co-heirs, petitioned the king regarding the manors of Collingham and Bardsley and the advowson of the church in Middleton which were part of the estates of the Earldom of Kent. During this time, there was disorder in south Wales due to a lack of forceful government leadership. King Henry designated Edmund as his leading representative in south Wales and he departed court and headed west. The government had made efforts to collect debts in the area since 1452. One of the first disputes Edmund encountered concerned Gruffydd ap Nicholas and his family. Edmund worked to curtail his abuse of authority and influence but Nicholas ignored all attempts initially. By the summer of 1456, a state of war existed in the area. Edmund had taken Margaret with him to Wales. She was small in stature and way too young at the time to consummate the marriage. But when a man married an heiress in medieval times, he received a life interest in her estates once he sired a child. This motivated Edmund to proceed with having sexual relations with Margaret, much to the indignation of his contemporaries. It was obvious he put the acquisition of estates ahead of the health and well-being of his wife. 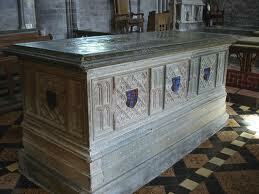 Margaret became pregnant in early 1456 while they lived in Caldicot Castle in the Welsh Marches. After making Margaret pregnant, Edmund returned to south Wales to establish personal authority. Nicholas was not happy to see him. Along with his sons, he took control of the castles of Carreg Cennen, Carmarthen, Aberystwyth and Kidwelly. Edmund did eventually regain control of Carmarthen in August of 1456 along with the other castles. After this, Nicholas and his sons finally acknowledged Edmund as overlord of the area. Nicholas’ family would remain loyal to the Tudor brothers from that point on. Queen Margaret issued a pardon of the family in October of that year. King Henry had another bout of madness and Richard Duke of York became Protector for a second time. When Henry regained his senses, York lost the protectorship putting Edmund in a dangerous position. His success and authority created hostility among York’s prominent adherents in south Wales. In April of 1456, supporters of York in the Welsh Marches, Sir William Herbert and Sir Walter Devereux raised an army of two thousand troops to re-establish York’s control in the area, including retaking those castles over which Edmund was constable. At first there were skirmishes in Herefordshire and then the army headed west to Wales. They attacked Carmarthen Castle and took Edmund prisoner on August 10. They then moved on to Glamorgan and Llandaff and ended up taking Aberystwyth Castle. Edmund was released not long after he was captured and died on November 3. The cause of death was given as the plague. But because his death was so sudden and surprising at such a young age, there is a possibility he died of violence or mistreatment in prison. He may also have suffered wounds fighting the Duke of York’s men. Margaret was pregnant and alone and shocked by her husband’s death. The income from Edmund’s property was valued at £600 and all of his holdings reverted to the crown. Margaret was given a very generous income of £200 in April of 1457. Jasper left court after his brother’s death and returned to Wales. He established a base for his earldom and gathered support for the House of Lancaster. He took Margaret under his protection at Pembroke Castle and her son Henry Tudor, the future King Henry VII, was born there on January 28, 1457. “under this marble stone here inclosed resteth the bones of that most noble lord Edmond Earl of Richmond father and brother to kings, the which departed out of this world in year of our lord God MCCCCLVI the third of the month of November: on whose soul Almighty Jesu have mercy”.